Dermabrasion is a term that describes a surgical procedure involving the removal or abrasion of the uppermost layers of the skin. Dermabrasion is done using sand paper or other materials. The most common substances used are Erbium:YAG laser or CO2. The procedure requires the use of local anesthetics because of considerable pain from the nerves that lie under the skin. After the dermabrasion, the skin looks very raw and red and it usually takes months for the skin to heal completely. 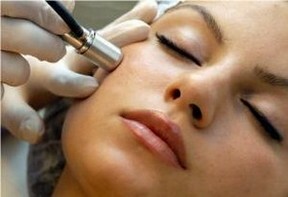 Dermabrasion is used for removing scars, tattoos, wrinkles and moles. Dermabrasion comes in various forms and one of which is the less invasive procedure called microdermabrasion. Microdermabrasion uses mechanical techniques in removing the outermost layer of the skin. Removal of the upper skin layer is called exfoliation. Microdermabrasion differs from dermabrasion in that the former involves only abrading thin surface of the skin, while the latter abrades more deeply. Dermabrasion is a surgical procedure, while microdermabrasion is non-invasive. Microdermabrasion is best for people with mild acne, dull skin, skin discolorations, superficial acne scars and pick marks. It is also best for people with busy lifestyles because microdermabrasion does not affect daily functions and heals fast. Deeper skin problems may require more intensive techniques such as dermabrasion or chemical peels. Microdermabrasion is also used to allow for topical medications to penetrate the skin better, and also allows smooth application of make-up. While microdermabrasion is relatively safe than other skin resurfacing treatments, it may also lead to microdermabrasion side effects. These microdermabrasion side effects are often mild and may resolve quickly. Most often, microdermabrasion is done on the face, which makes the area the common site of microdermabrasion side effects. The skin may become red after successive contact with the abrasive materials as microdermabrasion side effect. However, this is only minimal and may resolve in hours after the treatment. The pressure exerted in passing the diamond tip or bristle in the skin may cause skin tightness. The application of pressure for diamond peels also follows a certain pattern and this creates skin tightness. This microdermabrasion side effect eventually resolves as the skin returns to its original form. Skin tightness may be relieved by applying creams and lotions. Sensitive skins may also experience minor bruising as microdermabrasion side effect. This also results from the pressure of the material on the surface of the skin that may lead to minor breaks in the capillaries in the skin leading to bruising. The bruise may be removed by placing warm packs over the area. Since the uppermost layer of the epidermis is removed, the skin becomes sensitive following the treatment. Individuals who had microdermabrasion should avoid exposure to the sun several days after the treatment to allow the skin to heal completely and prevent skin burns as microdermabrasion side effect. Skin abrasions may also be present as microdermabrasion side effects. This is caused by the abrasive material used. Certain creams may be applied to hasten healing and prevent minor infections asmicrodermabrasion side effect. Following micordermabrasion, the skin may undergo inflammatory processes and the result is hyperpigmentation of certain areas of the skin as microdermabrasion side effect. This can be prevented by carefulmanipulation of the skin by the use of the abrasive materials. The presence of minor skin abrasions may also lead to bleeding as microdermabrasion side effect. This can be relieved by using cold compress over the area. People taking anticoagulants or blood thinners may experience bruising on the eye area as microdermabrasion side effect because of easy bleeding as a result of the medication. It is important to inform thedermatologists of certain medications used such as anticoagulants to prevent the occurrence of this microdermabrasion side effect. Since the skin becomes thinner, it may result in the appearance of underlying capillaries as microdermabrasion side effect. When the skin heals, it usually disappears. Patients who have inactive herpes infection on the lips and face may experience reactivation of the infection because of the manipulation of the skin as microdermabrasion side effect.